The Festival “Zodchestvo of Eastern Siberia” was founded at the turn of the millennium. The first Festival was held in 2001 at Irkutsk Sibexpocenter and caused a massive outcry among the architectural community in Siberia and throughout the country. Later he Festival “Zodchestvo of Eastern Siberia” became one of the most important annual architectural events in Russia. The Festival program includes review competitions of he best architectural works and involves architects from Eastern Siberia (such cities as Irkutsk, Angarsk, Bratsk, Chita, Krasnoyarsk, epublics of Buryatia, Tyva, Khakassia, as well as Ust-Ordynsky and Aginsky national districts of Buryatia). Since 2007 architects rom Western Siberia (Omsk and Barnaul) have also participated in the Festival. City ours conducted by the authors of new buildings and called “designer supervision” arouse great interest among colleagues and journalists. The most topical issues are discussed at the Discussion Club. Among he competent experts who expressed their opinions at the round table were Alexander Rappaport, Olga Vendina, Leonid Kogan, Alexander Vysokovsky, Alexander Gimelstein, Andrei Kaftanov, Mikhail Rozhansky, Andrei Ivanov, Dmitry Fesenko, Anna Sirina, Anton Finogenov. Prominent Russian architects give master classes, which enjoy great popularity. Within 16 years, with the help of the Festival, Siberian architects have met with masters from the capitals: Yuri Gnedovsky, Alexander Asadov, Sergey Kiselev, Alexander Skokan, Alexei Bavykin, Vladimir Plotkin, Andrei Savin, Andrei Cheltsov, Alexandra Pavlova, Sergei Skuratov, Nikita Yavein, Totan Kuzenbaev, Mikhail Mamoshin, Yuri Zentsov, Andrei Bokov, Timur Bashkaev and Sergei Gnedovsky, as well as Siberian experts Igor Popovsky, Alexei Myakota, Petr Anisiforov, Alexander Dering and many other colleagues. The organizers consider he Festival to be a preparation stage for he International Festival “Zodchestvo” in Moscow. “Zodchestvo of Eastern Siberia” s traditionally held in Irkutsk. In 2014 t was held in Krasnoyarsk, and this year Krasnoyarsk has housed the Festival for the second time. GRIGORYEVA, Elena. XVII International Festival “Zodchestvo of Eastern Siberia 2017”. 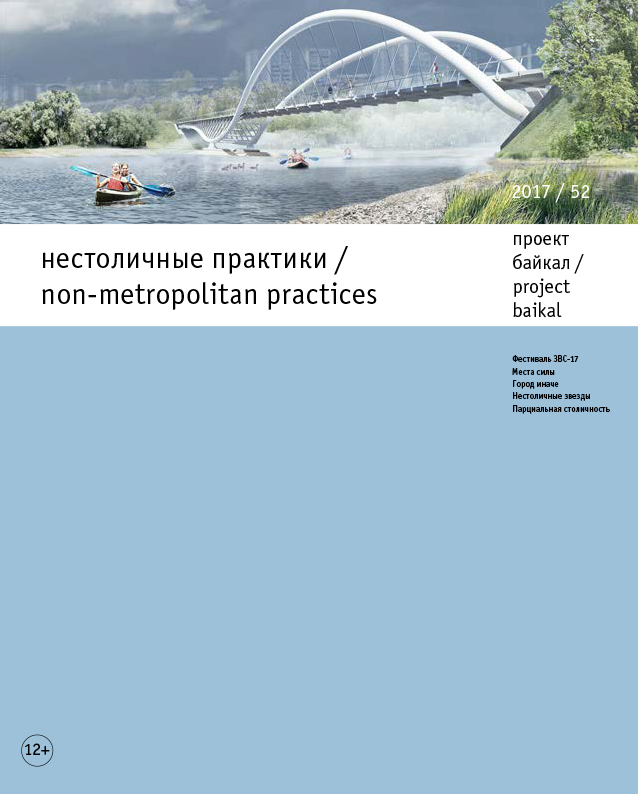 project baikal, Russian Federation, n. 52, p. 13-15, june 2017. ISSN 2309-3072. Available at: <http://projectbaikal.com/index.php/pb/article/view/1155>. Date accessed: 23 apr. 2019. doi: https://doi.org/10.7480/projectbaikal.52.1155.